It may only take two ingredients to transform boneless beef sirloin into delicious Garlic Steak, but that's because they're the perfect two ingredients. Spread garlic onto both sides of steak, pressing firmly into steak. Place in shallow glass dish or resealable plastic bag. 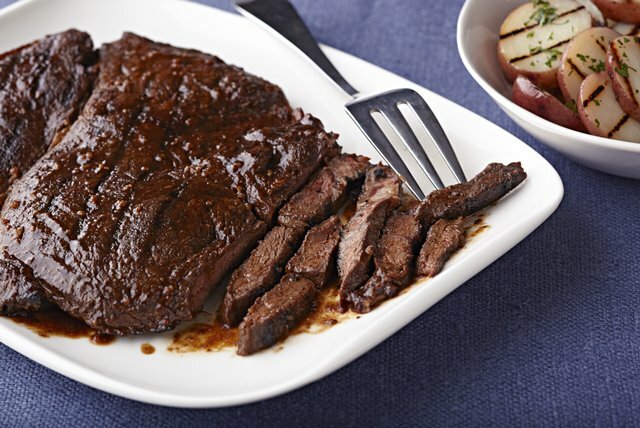 Pour steak sauce evenly over steak; turn to evenly coat both sides of steak. Cover dish or seal bag. Refrigerate at least 1 hour to marinate. Remove steak from marinade; discard marinade. Preheat grill to medium heat. Grill steak 5 to 7 min. on each side for medium doneness (160°F). Cut into 6 pieces to serve. Steak can be cooked under broiler instead of on the grill. Add sliced parboiled potatoes to the grill along with the steak for the last 5 to 10 min. of the steak cooking time. Cook until potatoes are tender, turning occasionally.